The leader of UKIP was given the prime slot this morning on the BBC’s leading current affairs programme, Today, to witter on about the looming referendum on the UK’s relationship with the EU. Was I alone in thinking: do we still have to listen to Nigel Farage? What became clear is that Farage struggles, like Alex Salmond, another limelight addicted leader with a habit of unresigning, to process defeat. Salmond couldn’t cope with losing the Scottish independence referendum and he behaved very oddly in the aftermath, giving endless interviews, chortling to himself and consuming pink champagne. As for Farage, he got almost four million votes for his party at the general election, which was a terrific achievement. However, in Britain, with a first past the post electoral system where seats count, a successful party must find a way of getting enough votes in the right seats. On this definition UKIP had a terrible general election, ending up with just one seat. After this performance, Farage should have resigned (as he promised to if he failed to win himself a seat) in order to hand over to an untainted successor capable of reaching out beyond the UKIP core vote in the EU referendum. Having unresigned, Farage now wants a big role in the Out campaign in the referendum and he is demanding that Eurosceptics put aside their differences, while he continues to take pot shots at the Tory Eurosceptics. This is exactly what the “Yes” to staying in crowd want to hear. They know Farage is one of their key assets in the battle to keep the UK in the EU, because he is toxic for so many voters. A few senior folk in UKIP understood this, which is why they tried to hold Farage to his word after the election by attempting to force him out. They failed, which leaves the Out campaign wondering how to handle UKIP. There may be senior individuals in UKIP who can play a useful role in the Better Off Out campaign. But Farage himself should play no part. He should be told to sling his hook. If he wants to run his own Out effort, it is a free country and he can do what he likes, although if he really wants Britain out of the EU he might be best going on holiday for the next two years. 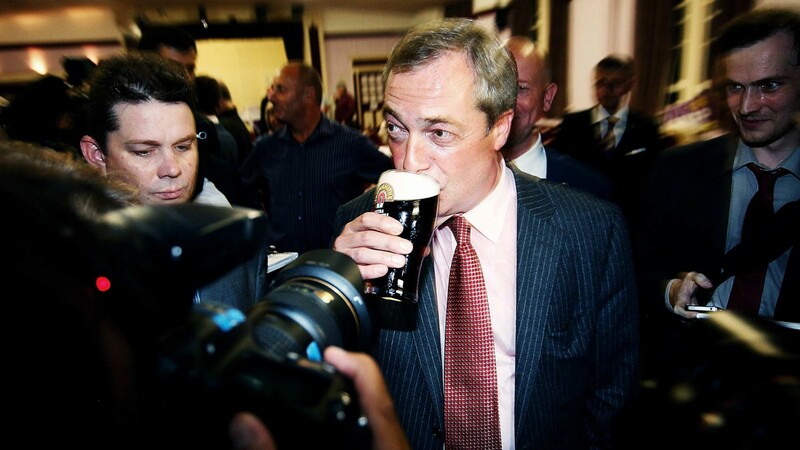 Ukippers have trouble understanding the dynamics, because to them Nige’ is the leader of the Purple People’s Army and a fearless crusader for truth, justice, smoking in pubs, English ale and plain-speaking (actually appalling dog whistle politics) on immigrants with HIV. ‎The task facing the Out campaign is herculean. They do not need to convince the 12.9 % of the electorate that voted UKIP. Such is their hatred of the Establishment and the EU that they will turn out to vote Out regardless of what happens in the campaign. Instead, Out must focus on securing the votes of another 37.2% of the electorate that didn’t vote for UKIP. That is how a referendum works. You need 50.1% to win. Many of those moderate, undecided voters who might be tempted by an outward looking message of improved trade links with the rest of the world and of the UK having control of its own borders, find Farage repulsive. It is no use Farage’s friends declaring that he is upbeat for free trade, and pointing out that he is married to a German and that he drinks a lot of French wine. It matters not a jot because his “brand” is fixed in the public imagination. He is cast as the pin-stripe suited saloon bar bore that most people have had enough of. His involvement would be death to Out. Already I know nice voters who might be tempted to take a punt on leaving the EU, but they cannot stand Farage. If they see the UKIP leader on the Out campaign platform they will vote to stay in because they do not want to be associated with him. Simple. Now, who’s going to break it to Nigel Farage? Next Next post: Will Nigel Farage’s Ego & Self Obsession Be Allowed To Aid The EU!